The wind blows my dog door open. 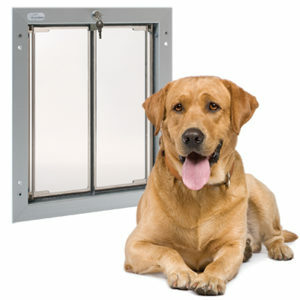 Is there a pet door that can withstand wind? If you live in an area with strong winds or other severe weather conditions, we recommend investing in a PlexiDor – the door will not blow open, and it will keep other types of weather outside. In high wind areas, even flap doors with strong magnets might come open. The flaps may also be damaged by debris blowing against them. Besides the obvious problem of drafts inside the house, the open door can let rain, snow, and insects come in. Extreme weather conditions may be able to blow even the PlexiDor open. In these cases it probably isn’t safe for your pet to be outside unsupervised. Bring them in and lock the PlexiDor. If there is a hurricane, we advice you to also attach the security plate.